The Best Indian Fashion blogs from thousands of top Indian Fashion blogs in our index using search and social metrics. Data will be refreshed once a week. Also check out Indian Fashion Youtube Channels. Indian Fashion newsletter is a comprehensive summary of the day's most important blog posts and news articles from the best Indian Fashion websites on the web, and delivered to your email inbox each morning. To subscribe, simply provide us with your email address. India About Blog Fashion at Vogue India - The latest fashion news, tips, trends, insider info, fashion shows and so much more, only at Vogue India. Facebook fans 1,993,966. Twitter followers 1,195,709. Mumbai About Blog We are India's first and only home-grown women's luxury lifestyle monthly. Being a glossy, the emphasis on paper, printing, processing and aesthetics is intrinsic, but what people come back to us for is the quality of content. We've been told that we stand out as a reader's magazine. And that's not an anomaly for a good-looking glossy. Facebook fans 317,901. Twitter followers 30,528. New Delhi, India About Blog The Shopaholic Diaries is a Fashion and Lifestyle blog founded and managed by Nitika Bhatia. It is a platform to share my love for shopping, fashion, beauty and style with fellow fashionistas. Facebook fans 151,289. Twitter followers 6,645. Mumbai, Maharashtra About Blog I am Gia kashyap, Founder & Creative mind behind . This a blogs about , beauty, style and more. Facebook fans 360,024. Twitter followers 8,955. About Blog Hey! I'm Akanksha, I started this blog somewhere in 2010 as an interesting means of noting, chronicling and expressing my ideas, projects, inspirations and daydreams. It has constantly evolved ever since and become more fashion & lifestyle oriented. I personally write all posts which vary from fashion to beauty to trends to food and then some more. Facebook fans 41,384. Twitter followers 9,691. India About Blog Indian Wedding Saree blog includes articles about Indian outfits ranging from day to day wearable salwar suits to elegant bridal wedding sarees to party wear sarees. Facebook fans 514,905. Twitter followers 2,312. India About Blog The best styling & online fashion community in India. Home to leading Image consultants & celebrity stylists, avail personal shopping, wedding styling & style tips. Buy from a curated brands clothing, shoes & accessories.Need shopping advice or style ideas. élanstreet offers personal styling services for every need. To find a styling package that's perfect for you, make your way to their stall. Facebook fans 53,975. Twitter followers 2,723. Mumbai, India About Blog Nihal Fashions is a leading online shopping store offering a unique designer indian traditional wear for men, women and kids. Facebook fans 2,401. Twitter followers 1,006. Mumbai, IN About Blog This blog by Aayushi Bangur offers an alternative perception to fashion, style and its related nuances. A blog that encompasses current trends, styling ideas and product reviews. Facebook fans 60,551. Twitter followers 7,313. Mumbai, India About Blog One of the Best Men's Fashion Blog in India. Updated daily by the Top Men's Fashion Blogger India Experts featuring latest Men's Style and Men's Fashion Tips. Facebook fans 7,418. Twitter followers 108. Mumbai, India. About Blog Everything related to skin care,makeup, product reviews of different brands, various tips and tricks,fashion ,news,etc. Facebook fans 32,397. Twitter followers 14,439. Mumbai, India About Blog A Mumbai based fashion, beauty lifestyle & travel blog. Facebook fans 40,683. Twitter followers 11,539. Goa, India About Blog India Fashion Blogger is a platform for every fashionable traveller. Find daily dose of fashion and travel on this platform. Facebook fans 17,489. Twitter followers 2,638. Kolkata About Blog Cherry On Top is a beauty and lifestyle blog which specializes in reviewing various beauty and makeup products as well as fashion brands and websites. We provide our readers with forthright views based on personal experiences. Facebook fans 5,595. Twitter followers 1,995. Mumbai About Blog Hello there, I'm Santoshi Shetty, as an Architecture student, I have grown to love design. In architecture school I have learnt to experiment with my spaces, this has also helped me immensely with my personal style. I have enjoyed playing with trends, colours, patterns and textures. The Styledge is my perception to fashion, style and trends. Facebook fans 26,606. Twitter followers 3,714. Kolkata About Blog SayeriDiary is a fashion and styling related blog of mine. I love to write reviews on different products as well, specially beauty and makeup stuff. Facebook fans 2,547. Twitter followers 1,277. New Delhi, India About Blog StyleDotMe provides instant fashion advice and some real style inspiration when you really need it. Facebook fans 12,441. Twitter followers 397. Facebook fans 7,171. Twitter followers 41. New Delhi About Blog Indian Fashion Blog focusing on Indian fashion, fashion designer wear, woman clothing, designer dresses, get fashion advice and tips, latest fashion trends in India. Facebook fans 72,188. Twitter followers 950. Mumbai, India. About Blog This is a Indian Fashion, Beauty and Lifestyle Blog by Aaashna Shroff. Facebook fans 67,901. Twitter followers 5,771. Chennai About Blog Gender neutral fashion designer & most read Indian men's fashion blogger. Most read men's fashion blog in India. Facebook fans 4,792. Twitter followers 1,597. India About Blog Get all fashion and textile B2B business solutions plus fashion and textile B2B business services for all your fashion business needs. Also get news, informative articles and market analytics report on Fibre2Fashion. Facebook fans 100,294. Twitter followers 4,592. Bengaluru, India About Blog BIG hair LOUD mouth is an Indian Streetstyle Fashion Blog by Nilu Yuleena Thapa. Though BHLM started as a personal style diary with Style being the core content of BHLM, Nilu also discusses her beauty experiences and travelogue through her blog. Facebook fans 28,445. Twitter followers 1,251. New Delhi, Delhi About Blog I’m Meena, an Indian- Delhi resident. And just like Delhites do, I love travelling, dressing up and of course spreading happiness. My blog is unusual, anything but boring, quirky, trendy and ah-mazingly experimental! Facebook fans n/a. Twitter followers 15,880. India About Blog My Fashion Villa is an Indian Beauty, Fashion, Lifestyle & Travel Blog with latest fashion trends, lifestyle, beauty product reviews and more. Facebook fans 3,414. Twitter followers 6,874. About Blog has evolved from 2 girls playing dress-up, to a high fashion platform for brands to connect with their real customers, and for young women all over to understand and be inspired by our personal styles. Facebook fans 34,076. Twitter followers 848. Mumbai About Blog bowties and bones is a Men's fashion, culture and lifestyle blog.This blog gives you weekly updates on fashion, style tips, and everything under the sun a man should be aware of. Regular guest posts from specialists in their field will be interspersed with content from the founder. Facebook fans 10,485. Twitter followers 730. Bengaluru, India About Blog A Curious Fancy is a plus size fashion blog with a side of vintage. Ragini is a plus size fashion blogger with a fondness for the eccentric. She is unapologetically fat and femme. This blog is a chronicle of her personal style over the years. Her blog has been featured in Grazia and Marie Claire India. Facebook fans 4,355. Twitter followers 2,422. Mumbai, India About Blog Cosmochics is about lifestyle,fashion and makeup. This website is all about our personal style and experiences with products and places. Facebook fans 10,394. Twitter followers 1,117. Facebook fans 19,925. Twitter followers 44,464. Delhi About Blog 'That Delhi Girl' blog is a Fashion & Lifestyle blog by Pallavi Ruhail. She started the blog around mid-2013 to materialize her serious affair with fashion and everything fancy in a substantial way. Facebook fans 31,037. Twitter followers 24,460. New Delhi, India About Blog Stay Stylish and chic with Latest fashion trends, makeup tips, hairstyle and DIY at FashionGoodTimes. Facebook fans 1,255. Twitter followers 375. Mumbai, India About Blog I founded my blog on a whim back in 2010 as an outlet for my fashion hedonism and now it’s become a huge part of my life, something I work on daily to document my daily style, an outlet for my editorial creativity and simply, my love for all things sartorial. Facebook fans n/a. Twitter followers 15,092. Bangalore About Blog A crazy chic next door; who likes to jump into anything new related to fashion, art, style even gardening! A versatile person and a thinker, I am a Fashion, Textile and a Graphic designer. Facebook fans 2,184. Twitter followers 865. Pune About Blog I am a 23 year old fashion blogger and a stylist. I am also an MBA, work as a part time graphic designer and a freelance photographer. I believe in living life by pursuing what you love and giving in your best at whatever you do. Facebook fans 22,535. Twitter followers 4,221. Mumbai About Blog I am Juhi, A 24 year old from Mumbai. The idea behind this blog is to capture my personal sense of style and showcase everything that inspires my fashion sensibilities in the form of images, videos and more. Facebook fans 5,097. Twitter followers 565. New Delhi About Blog is a fashion, style and blog for young girls, boys and women who believe that fashion runs in their bloodstream. It’s your personal guide to stay updated about the latest fashion trends, styles, ideas, tips, DIYs, how-tos and much more. Facebook fans 3,023. Twitter followers 719. Delhi About Blog ‘Fashion and I’ began as the style diary of Aien Jamir in the year 2009 to chronicle her personal style and views on fashion. Close to a decade and after gaining popularity and readership it has evolved from being a fashion blog to an all encompassing portal as it explores the intersection between Fashion, Lifestyle, Beauty, Food, Travel and many more. Facebook fans 33,633. Twitter followers 7,509. Mumbai About Blog I'm Shanaya, a 23 year old Mumbai based Blogger, sharing my ideas about fashion, beauty and lifestyle. Facebook fans 10,408. Twitter followers 8,631. Mumbai, India About Blog Sarang Patil is a fashion influencer, stylist, creative consultant and model of heisgotthestyle.in; whose site and combined social media reach over thousands impressions each day. Sarang currently resides in Mumbai. As one of the top fashion tastemakers and influencers in the city, he has appeared in prestigious publications both print and media such as GQ India, Buzz feed, Mens XP, Society, GQ India(online), Youth Incorporated and more. Facebook fans 55,937. Twitter followers 9,703. About Blog I’m Sharon, a Delhi girl talking about fashion, lifestyle and travel. I love experimenting with the new trends in fashion and mostly create content around global street style fashion. I share all my experiences through this blog. Hyderabad About Blog A fashion & lifestyle blog, which now regularly features TheGirl's personal style and whimsical musings, as she struggles to satiate her ever present itch for traveling and doing ten things at a time! Facebook fans 4,580. Twitter followers 954. Bangalore About Blog HI, I am Farah. On Six Inches Of Pleasure I share with my readers my personal style, seasonal trends, beauty tips and all things good and bad under lifestyle. Mumbai About Blog HI, I am Usaamah Siddique. As a clothing-obsessed individual, I became the go-to resource for my mate’s fashion-related questions. As a response, I started The Dapper Label to share my opinions on Men’s style. This blog is constantly evolving and will feature Fashion-forward to Classic looks for the Dapper man. Facebook fans 8,608. Twitter followers 413. India About Blog Fashion Oomph as the name speaks is a fashion blog and Fashion is my passion and oomph defines the energy and excitement behind it. I firmly believe that Fashion is related with every individual in every stage of life and it shows the attitude of a person. Facebook fans 19,929. Twitter followers 64. Bengaluru, India About Blog Visit my blog to know more about DIY, beauty and lifestyle, this is a blog by a Kolkata girl (staying in Bangalore, India ) about beauty, DIY, nail art and reviews. Facebook fans 2,810. Twitter followers 3,544. India / Bhutan. About Blog Hi I’m Manou. I am a photographer from India. This blog is about Street style and fashion. Facebook fans 12,203. Twitter followers 5,281. Surat, India About Blog HI, I am Shweta Shah. I have been a fashion freak and always loved glamorous fashion world since the days of my childhood.I should instead admit that love for fashion was always been a part of my embroidery! Facebook fans 3,425. Twitter followers 207. Delhi, India About Blog The one and only street style menswear blog dedicated to Indian men. Get daily style tips and budget clothing options. Men's Style, Fashion, Grooming, body building Tips and Advice. Facebook fans 8,220. Twitter followers 294. About Blog Get updated on the latest fashion movements. Good buys, current trends, new styles, store reviews, styling tips, savings, happenings, events, mommy friendly tips and baby fashion all at your fingertips. Facebook fans 15,420. Twitter followers 6,192. India About Blog The Fashion Blogging is a weblog site bringing to you the latest on what's happening in the world of FASHION and LIFESTYLE. Our fashion blog has a variety of latest and trendy style for men & women. Facebook fans n/a. Twitter followers 1,203. Pune About Blog June Biswas: An Indian Fashion, Beauty and Lifestyle blogger discussing latest Fashion Trends, Stylish Outfit Ideas and Product and Food Reviews. Facebook fans 1,357. Twitter followers 1,787. Mumbai About Blog Wasted By Fashion is that one blog which not only provides you with wardrobe inspiration but also helps you select products by personally using it and reviewing it. Facebook fans 9,451. Twitter followers 666. Facebook fans 21,618. Twitter followers 633. About Blog An Indian blog about fashion, makeup and beauty. Chic and stylish lookbooks, makeup tips and beauty products reviews. Facebook fans 2,192. Twitter followers 405. Bangalore, India About Blog Menswear style blog for the modern man looking for affordable style. Sneaker features and reviews. Facebook fans 6,257. Twitter followers 137. Pune, Mumbai, India About Blog FashionMate is a fashion & #beauty Blog that covers top fashion trends, Beauty tips, Make-up tutorials, Style hacks, latest Fashion news, Travel tips & Celebrity Style all under one roof! Fashionmate thrives to bring you all things fashionable! Facebook fans 5,602. Twitter followers 4,497. Bombay About Blog Plus Size fashion blogger Amena Azeez of Fashionopolis shares her love and views on Fashion, Beauty, Feminism, Body Positive and Pop Culture. Facebook fans 4,236. Twitter followers 8,543. Bengaluru, India About Blog Skulls And Tulles is a visual representation of Smita’s personal style, mostly showcasing outfit inspirations based on trend analysis, existing and imminent fashion, along with some fun and creative styling. Facebook fans 1,816. Twitter followers 1,103. India About Blog Style Over Coffee is India's top Fashion and Lifestyle blog by Sarmistha Goswami. Style Over Coffee publishes articles every week on fashion inspiration, style and beauty tips, travel articles and beautiful photographs. Facebook fans 4,370. Twitter followers 1,690. About Blog The Right Shade of Red is a fashion, beauty & lifestyle blog by Urvashi Kumar focused on finding yourself, through the creative expression of your personal style. Facebook fans 14,495. Twitter followers 373. New Delhi About Blog This is an Indian Fashion & Lifestyle Blog by Sukhneet Wadhwa. Facebook fans 7,492. Twitter followers 2,046. About Blog That elegant chic is a space in the web where we intent to bring style and fitness to every woman who believes in feeling good inside out. We aim to make style and fitness a lifestyle choice and not something that takes a lot of effort. It is our way of reaching out to all the girls like me who love to dress up, love to style themselves and the word “shopping” make their eyes sparkle. Facebook fans 3,417. Twitter followers 912. New Delhi, India About Blog My name is Aarushi Jain, a 25 year old living in Delhi, India. I created this space to share my perception to all things beauty, fashion and lifestyle. I write about beauty tips, makeup techniques, makeup tutorials, style ideas, fashion trends, product reviews, life hacks & my travel diaries. Facebook fans 8,586. Twitter followers 273. About Blog A Brief History of the saree blouse and Indian fashion before 1960 with an occasional excursion after. Facebook fans 1,482. Twitter followers n/a. Bangalore, India About Blog A Luxury Fashion, Beauty and Lifestyle Blog by Chaicy. Facebook fans 48,615. Twitter followers 6,293. Delhi About Blog FTLOFAOT is an exhaustive compilation of my experiments with fashion and all that it encompasses. This includes my love for fashion, styling, make up and a lot of other creative avenues. Facebook fans 20,683. Twitter followers 3,950. About Blog Hi, I'm Varna and this is my journey of Musing On A Hanger. This is a platform dedicated to the ones who, like me, spend hours lost in thought wondering what to wear before stepping out. This style oriented blog is brought to you with the intent to inspire and to be inspired from the art of fashion that's ubiquitous. Facebook fans 979. Twitter followers n/a. India About Blog KacyWorld is an online Fashion Shopping Store where you can buy fashion jewellery, accessories, Footwear, Clothing and beauty products at most reasonable prices. Facebook fans 20,895. Twitter followers 989. New Delhi, India About Blog Labels and love is the brainchild of a fashion enthusiast child Pratibha Bhadauria where she shares fashion, beauty tips and more. Facebook fans 18,439. Twitter followers 1,426. India About Blog Rudrita Chatterjee was born in Delhi presently based in Kolkata. In 2010, she started working with fashion and lifestyle and in the year of 2013 she launched her own online brand ‘Rudrita’. Facebook fans 298. Twitter followers 7,225. Mumbai.Dubai About Blog My Haute Life is a celebration of all things I love- Fashion, Lifestyle & Travel. For me, playing dress up began at the age of five and probably never ended. Realising my vocation was meant to be in the design scene I fully immersed myself into the fashion world. Follow me on this amazing journey and discover the latest style trends, new hotspots and exotic travel locations. Facebook fans 10,240. Twitter followers 1,098. About Blog At Poshaakh, we design & craft our products to compliment these aspects of your persona. We intend to bring out the beautiful hidden traits in you & to show you that you deserve better. About Blog Musing on fashion, handicraft, sustainability narratives, cruelty-free beauty and eclectically homegrown design. Facebook fans 3,747. Twitter followers n/a. New Delhi , India About Blog Hi, I am Surbhi. Fashion stories and personal styles from a fashion optimist, skillfully blending them to create my own into staying stylish forever ! Incorporating Daily trends and fusing them into your everyday wear is what my blog is all about ! Facebook fans 3,596. Twitter followers 1,074. Bangalore About Blog Hello! Meet Nischita. Bangalore based fashion blogger with an eye for personal style and everyday fashion. I believe in street style and yet stand out in the crowd. Facebook fans 7,298. Twitter followers 2,045. Mumbai About Blog Plus Size Indian Fashion and Lifestyle Blog by Reeneta. Stay updated with latest fashion & lifestyle trends, personal style reports for your daily inspiration, DIY and how to videos, skincare and haircare tips and all about living a healthy and body positive life. Facebook fans 11,732. Twitter followers 1,847. India About Blog Hi, we are Shivi Tandon & Srishti Agarwal. We bring to you fashion, style and creativity in our own different perspective. Although the name justifies itself, our main objective is updating you with posts which are primarily focused on current and upcoming trends that ignite curiosity in people. We’re here to exhibit to you want we think catches the eye or will be in trend. Facebook fans 7,980. Twitter followers 377. Kolkata About Blog Dialifestyle is a Fashion, Beauty and Lifestyle blog which speaks about unconventional fashion, breaking steriotypes in fashion, body acceptance, thrift shopping, product reviews, store reviews and much more. The blog gives it’s readers an insight to the Fashion and Lifestyle events in the city. Facebook fans 1,913. Twitter followers 232. India About Blog The mean wardrobe is a fashion, lifestyle and travel blog that caters to mens and womens fashion. A blog put together by two passionate fashion designers. Facebook fans 4,603. Twitter followers 188. India About Blog Fictitious Fashion is a fashion and style blog by Akanksha Chawla. Facebook fans 2,734. Twitter followers 784. About Blog Chiconomical is an effort to show that dressing well doesn't require a lot of money. A visual guide to the all best places to shop on Mumbai Streets! Facebook fans 675. Twitter followers 497. Mumbai About Blog Head2Heels is a personal style blog with tips on how to dress up Or down. Head2Heels is aimed to inspire the fashion conscious girl who's on a budget. Our forte would be street shopping and scoring great deals and bargains. Facebook fans 3,733. Twitter followers 2,279. About Blog Hello fashonistas! This is Shrithi, founder of Chic Iconic. I do the write up for the fashion statements, styles and tips. Stop and have a glimpse of Chic-Iconic blog, take tips, follow posts and turn yourself a smart fashion Icon with very minimal details, but great sense of fashion. Facebook fans 49,278. Twitter followers n/a. New Delhi About Blog An Indian fashion blog that aims to capture interesting Indian street style.This is a fashion and lifestyle blog inspired by a poem I once wrote. It is mostly about fashion and its relevance in everyday life. Facebook fans 592. Twitter followers 9.
kolkata, india About Blog Chikky ventured into Fashion Styling in early 2014. From personal styling to conceptualizing editorial shoots. Her passion for fashion resulted in Styleograph by Chikky Goenka, a popular fashion blog based out of Kolkata, that talks about her personal style, Indian designers and glocal trends. Facebook fans 8,421. Twitter followers 313. About Blog Matargasht is an urdu word which means the one who wanders aimlessly. We at matargasht, are absolute matargasht who find our happiness in chronicling street style, writing about our city Delhi, loving fashion and doing all that makes us happy. Facebook fans 7,176. Twitter followers n/a. Guwahati, Assam, India About Blog A Indian fashion, Perosnal style and Lifestyle blog by Chaynika Rabha. Facebook fans 3,008. Twitter followers 251. About Blog A fashion and lifestyle blog by Rituparna. Facebook fans 3,269. Twitter followers n/a. Mumbai About Blog A fat girl's decadent fashion diary .You will experience some immaculate take on fashion trends on a thick body from this Desi girl. Delhi About Blog A fashion and lifestyle blog on street styling for women, travel stories from India, bollywood celebrity style trends and fashion shopping tips. Facebook fans 1,912. Twitter followers 1,103. Ahmedabad About Blog "Appleblossommy" redefines the concept of Styling. Learn how to make the current trends work for you in different budgets rendering versatile looks. An aesthetic platform of carefully curated Fashion & Lifestyle products & Expert Opinions by Falguni Patel. Facebook fans 15,334. Twitter followers 588. Mumbai About Blog Hey I am Saily, social media strategist turned full time blogger at my very own . started out of much love for fashion & photography. Facebook fans 3,818. Twitter followers 961. Mumbai About Blog We are Jasleen and Sonu, two close friends who share a common bond and liking for fashion. Fashion Bombay is not about trends or glamour or looking great, it is two friends who have been on a journey of self-realisation and expression using fashion as a celebration of passions, travels and the life we live. Facebook fans 970,747. Twitter followers 12,634. Pune About Blog Indian fashion & lifestyle blog for todays smart intelligent woman. Because showing up to greet each with joy and intention makes life beautiful. Facebook fans 3,480. Twitter followers 687. About Blog An Indian fashion, beauty and personal style blog peppered with words like poetry. Facebook fans 11,330. Twitter followers 6,729. About Blog When world is your runway, everyday is a fashion show The crunchy fashion focusing on fashion and lifestyle, I also want to create a space for affordable fashion. Spending big bucks is not required to be on the top notch, passion is all that drives. Mumbai About Blog A personal style blog by Shivani Patil. Facebook fans 3,823. Twitter followers 1,369. About Blog Welcome to Wanderuffles! A blend of travel and fashion all together for you. Come let me show you the world through the sneak of style and Fashion. Facebook fans 197. Twitter followers n/a. India About Blog An Indian Fashion blog by Indibala Collections. Mumbai, India About Blog My name is Murup Dolma and I hail from a small town called Leh. Photography and Fashion is my idea of fun. An art. A way to express oneself. It brings joy to me and my interests have kept growing over the years. I started my blog to have a creative outlet, to share my views, ideas, experiences and opinions about things I love and also to feed my fashion appetite. Facebook fans n/a. Twitter followers 24. Calcutta About Blog Live Laugh Dressup is a fashion and lifestyle blog for style inspiration, small DIY projects and lot more. Facebook fans n/a. Twitter followers 711. India About Blog Hi!! I am Ruchi Waila from India, A nurse and a fashion enthusiast. I love to style. I take inspiration from everything around me, COLORS ARE WHAT I AM CRAZY ABOUT. I started this blog to share my views and inspire you in any possible way I could. SO, join me in this journey full of fashion, art and a lots and lots of colors. Mumbai,India About Blog This a Fashion,Personal Style & Lifestyle Blog by Stephanie Timmins, Fashion and LifeStyle Blogger. It features your regular dose of Sunshine,it reflects all things beautiful through my vision. A unique perspective on the latest fashion trends,my gourmet delights, personal styling tips& treasured finds. Facebook fans 20,884. Twitter followers 8,927. About Blog 'The Nyeree Diaries' is a blog dedicated to those who love Fashion, Beauty, Travel and style. I started it with the intention of having a platform to showcase all the little bits and pieces of my life related to these fields. India About Blog Fashion and Beauty Blogger Kuwait, India. Facebook fans 23,775. Twitter followers 2,560. Ohio, USA About Blog Fashion and Lifestyle Blog! The idea behind this blog is to capture my personal sense of style and showcase everything that inspires me. Facebook fans n/a. Twitter followers 1,071. About Blog Look Suave is a f men's fashion and lifestyle blog by Aditya Jain. It's all about personal styling, fashion,lifestyle,brand styling. Facebook fans 1,285. Twitter followers n/a. India About Blog Fashion & Lifestyle blog by Renisha. Facebook fans 2,967. Twitter followers 185. 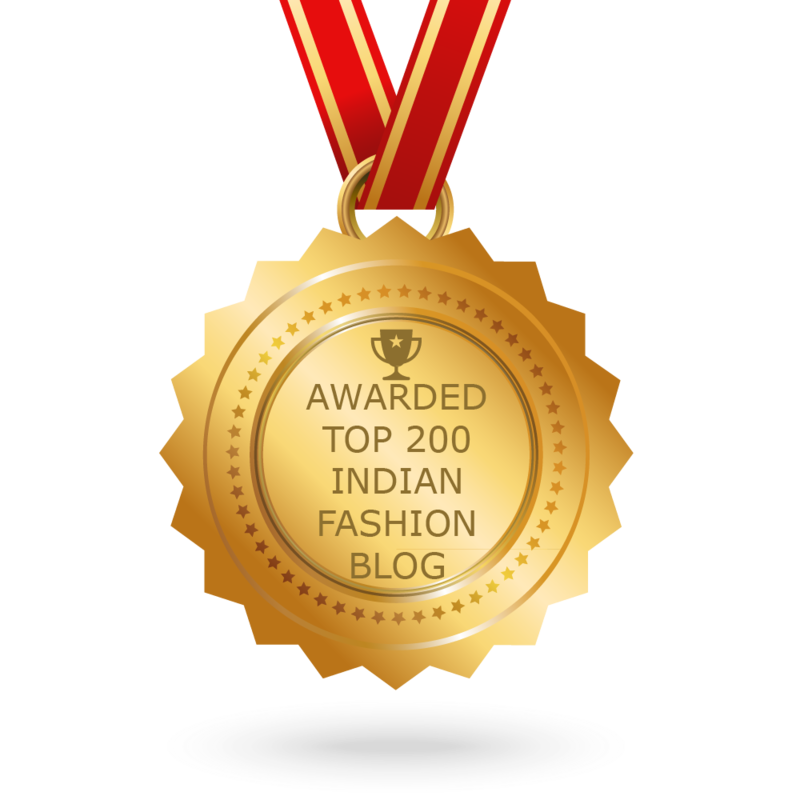 CONGRATULATIONS to every blogger that has made this Top Indian Fashion Blogs list! This is the most comprehensive list of best Indian Fashion blogs on the internet and I’m honoured to have you as part of this! I personally give you a high-five and want to thank you for your contribution to this world.